Hitler had a ranch in Colorado? It snowed ducks at least once on I-70? Colorado has the original Hard Rock Cafe? Jack Dempsey fought his first professional fight in Colorado? For over five decades, Abbott Fay has been written four books and hundreds of articles. 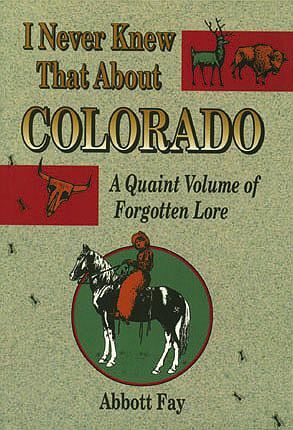 A retired history teacher and an adjunct professor for three Colorado colleges, he has gathered in this book little-publicized or long-forgotten fringes of history, each of which is unique to Colorado lore. Read about Mark Twain and Denver Censorship, The Man Who Wore Out His Coffin, Slavery After the Civil War, and many, many other fascinating stories. This illustrated collection of little-known facts and stories, studiously researched and reviewed, covers all of Colorado. Curious visitors to our wonderful state will enjoy adding to their knowledge about all the places they have visited!